It's hard to believe, but my boys have just two weeks of school left before summer break. Call me crazy, but they've had a wonderful year and I'm a little sad to see it end! The last few weeks have been crazy busy though-- baseball championship games, field trips to the zoo, school performances, birthday parties and more. It's to the point where I think I may have dropped the ball somewhere along the way... but I have no idea where. So yeah, I'm a little sad... but it's good to see the light at the end of the tunnel too. 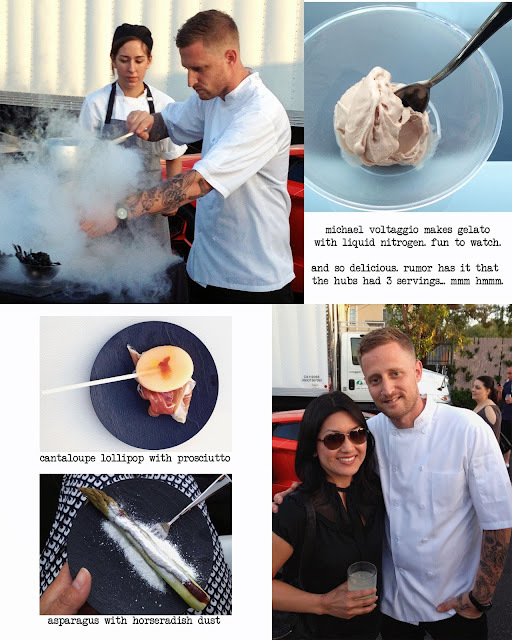 On a fun note, we got to meet Michael Voltaggio of Top Chef fame (season 6 winner and owner of ink. in West Hollywood) and were able to partake in his innovative molecular gastronomy-style cuisine. The dishes were delicious, fun and beautifully plated. I'm so looking forward to this weekend. We are celebrating my FIL's 80th birthday! It'll be nice to celebrate his amazing life and spend quality time with close family and friends.